This coastline has the attractions of the West – some beautiful beaches, diving and snorkelling opportunities, historic and interesting sights without the crowds. There is easy access to several National Parks – Bundala, Yala- and the old town of Galle is one of the most interesting in Sri Lanka. Once a major port, Galle shows its colonial Dutch and Portuguese history. 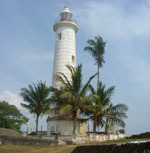 Most imposing is the Fort (a walled town and Heritage site) which houses the national Maritime Museum, the National museum and the more recent (1938) lighthouse. The Fort ramparts allow an hour or two’s gentle stroll, best taken at dusk to enjoy the sensational sunsets from the Western Bastions. Previously occupied by many Muslim families, the Fort is now being taken over by wealthy ex-patriate investors. Old derelict buildings are being bought for small sums of money and renovated to exquisite interior design standards. Many of these private villas and some larger commercial boutique Hotels like the Galle Face Hotel are opening in 2004 and we will keep you informed. The New Oriental Hotel- neither new (1864) nor Oriental is undergoing refurbishment by the Amman group and should be interesting when completed. Galle is the centre for craftspeople and particularly famous for its lace. Hawkers are a nuisance here so don’t be taken in by any plausible or heart wrenching stories told. Jewellery, ceramics, Dutch period furniture and religious statues and brass work can be purchased. Sri Lanka is also the home to many superb artists, and Galle’s private galleries display some of the best. Surrounding the harbour, Galle town climbs high with winding residential streets. Lawyers, businessmen and diplomats can be found in abundance, making this City, albeit rather ugly and dirty, a focal point of the up-and-coming socialites. Along the ramparts and in the parks you will see "coy courting couples" take hiding. Unless you are an avid historian, Galle is only really worthy of a 1-3 day stay but some of the best boutique hotels ensure that it is the most luxurious visit. Numerous Boutique hotels have launched around the Galle area and are just a 15min stroll from the Fort. A liitle further out of Galle, you can takeover a private Villa, super colonial residences and fully staffed. A very wide curving bay and clear waters but sadly very narrow beaches. The off-shore reef can be reached easily and gives sheltered and safe swimming. It also boasts more species of fish than the great Barrier Reef. An excellent centre for families to mix beach fun, diving, snorkelling and swimming with day trips to Yala or Hambantota Bird Sancturary. Stay at a colonial villa with meditation and yoga Pagodas in the garden or opt for a more laid-back guesthouse which are generally family run. Unawatuna is quite tightly packed on the penninsula and many hotels are set within the mountain rocks. Just 10 mins from Unawatuna on the coastal road lies the small villiage of Thalpe. The beaches here are more secluded and private and have become a favourite spot for Western weddings/honeymoons. many of the villas have chosen have prime positions and beach lagoons, welcoming families and couples alike. Onland are charming woodland residences on the lakes, ideal for groups, bird lovers and privacy. The temples on Koggala Lake’s island provide a most romantic setting for that important day. A small village but an ideal base for day trips and new beach discoveries. It is popular for surfing and swimming spots with narrow clean beaches. The beaches are deserted and the only faint noise is from the occasional express bus on the Galle Road as they compete for passengers. Translated as Sandy Village, Welligama is actually a busy fishing village with a stretch of beach and small picturesque coves. Sadly the water is not clean enough for swimming. Stilt fishermen can be seen at dawn and dusk when the tides are right, balancing on their long poles in locations jealously passed from father to son. If you covet your own tropical paradise, there is an island and villa to be privately rented and reached on foot at low tide or by boat. In shore reef, great surf, and swimming are all options at Dickwella. Sun bathing can be enjoyed in the privacy of gardens and private bays. Hoo-aanyia Blowhole is a spectacular natural phenomenon and day trip. From May to July, high seas force water 23m high through the rock chimney, then a further 20m into the air. Tangalle has stunning pink beaches for sun worshippers which look inviting but steep drops and rip tides can make the sea dangerous. Go East to where the off-shore reef breaks the surf and provides calm water and safe diving. The town is very unsophisticated and tourism has had little effect. Whilst this is good to see, simple amentities are very difficult to find. Set on the beach, enjoy the eco beach cabanas of Palm Paradise Village and visit Yala, or Uda Walawe safari parks and the turtle conservation project at Rekawa. Or for something rather more luxurious, rent a private villa. where the staff will indulge you. Neighbouring Tangalle is the home to thousands of flamingoes. Bird watchers will thrive on the migrant birds which visit this point of the island. For further details see our review of Bundala and birdwatching locations. Yala is on the South East corner of the island but lies within the Uva Province. The 4WD safaris make for an exciting day trip from the South beach resorts and if you are lucky you will see a leopard. In October, as the park reopens after mating season, you can also catch many cubs as they follow mother to water and shelter from the rain.